Last year our church [that's United Church Ferndown] put a Christmas Tree in the Festival in nearby St Martin's URC, West Moors. 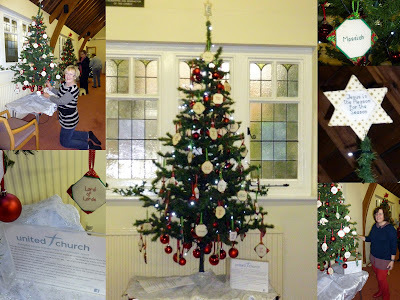 It was a true labour of love, nearly 40 women, of all ages, worked to sew and cross-stitch these lovely diamonds - each bearing one of the biblical names of Jesus. But you can never win - one or two ladies said they did not have enough time [I had started the project in September] So this year - we have started in July - that way everyone will have adequate time to make their piece. "The angel answered, ‘The Holy Spirit will come on you, and the power of the Most High will overshadow you. So the holy one to be born will be called the Son of God"
Often the symbol of a dove is used to portray the Holy Spirit. So we are making doves. 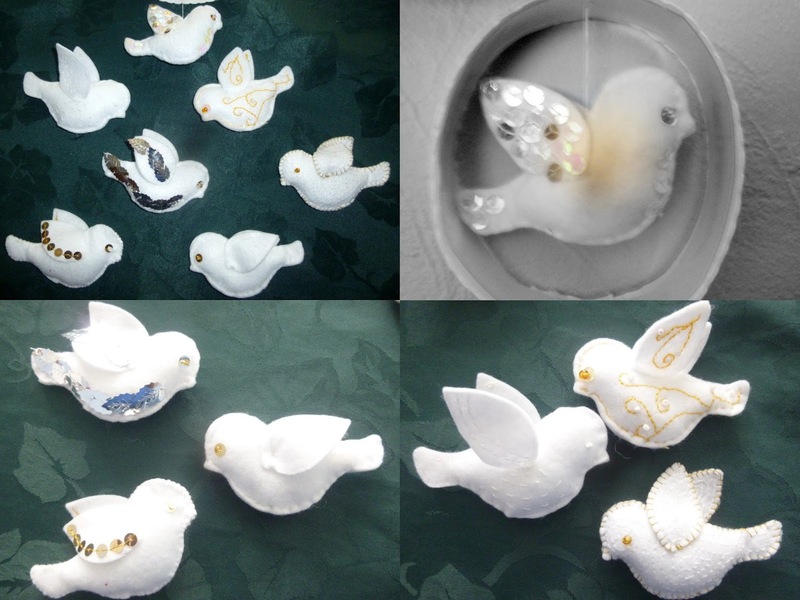 This is a two stage project - after sewing the doves we will make frames to support them. I've spent June and July preparing packs of materials, and stitching some prototypes. Over 30 people have taken packs, and one has been returned already. The packs contains the felt pieces, wadding, and a few beads and sequins - and the needlewomen [no men have volunteered to help!] can choose to work only in white, gold or silver. That way the birds will be individual - but look harmonious. After the summer, I will have to give out Part 2 of the project. The other lovebirds we are celebrating at Church today are our friends Geoff and Rosemary. It is their 65th Wedding Anniversary [Sapphire] Tonight they are having an event with family and friends. This lovely couple met when they were Maths Students at Southampton, and both went on to be teachers. 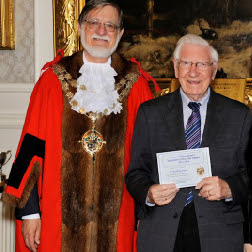 I haven't a picture of the pair of them together, but here is Geoff with the Mayor when he was nominated for Bournemouth Volunteer of the Year, a while back - after 15 years service as a Volunteer Safety Guide and the completion of 500 safety tours with schoolchildren during that time. After the party, we will be on holiday. Norfolk, here we come! 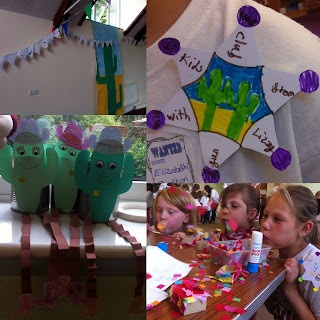 Day 3 - bunting from Day 2, sheriff's badges, cactus cans [made on Day 1] - and the discovery that little squares of tissue [intended for craftwork]are wonderful to blow around the table like wedding confetti. ...so we all voted that they should be the ones for the cold shower! 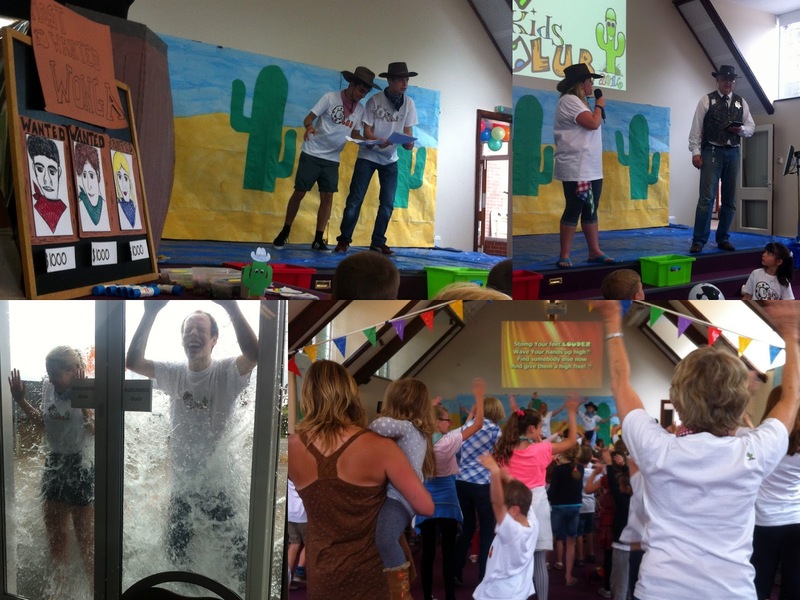 It has been a great Club - with the Family Fun Day this afternoon, and Closing Service tomorrow morning yet to come. 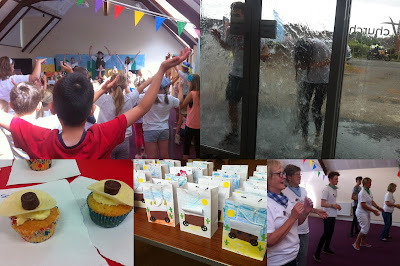 Thank you to everyone who made it so special. What a privilege to work with a team like this! I posted last week about the Norwich Shawls and the exhibition in October. There are two parts - the display of shawls, and a second exhibition of contemporary artwork inspired by the shawls. What I failed to say then [because I hadn't completed the project] is that I am entering a piece into the Exhibition. 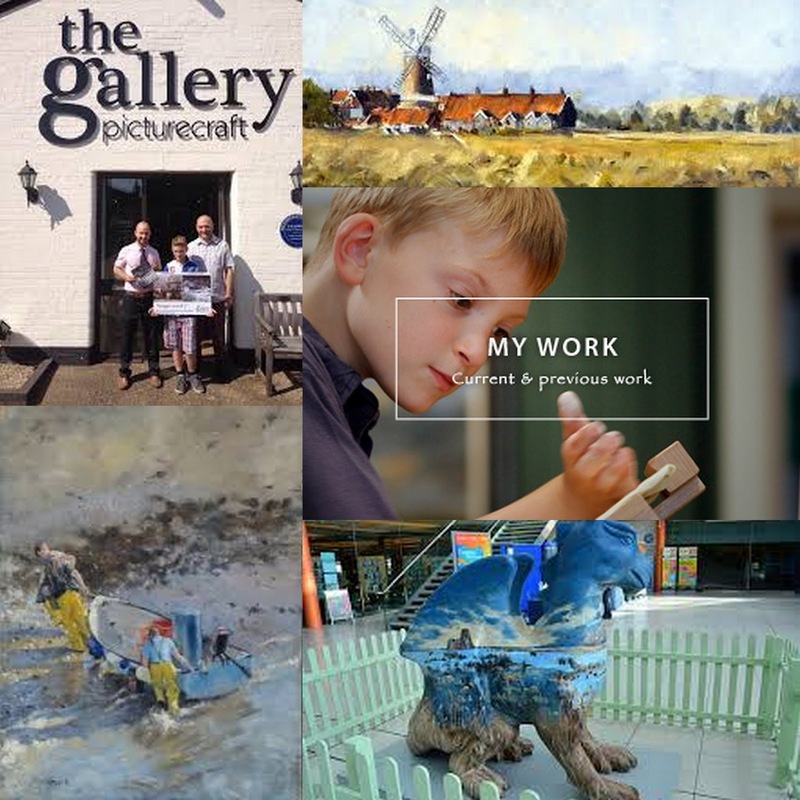 Photographs of entries [plus the £10 fee] have to be sent in by 1st August, then the judges will decide which pieces will be put on show. 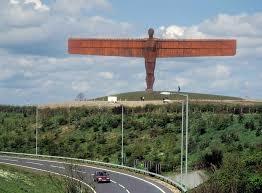 If mine is selected then it will go up to the Cathedral at the end of September and be put on show. I have no idea if I stand the remotest chance of winning a place. This is, I think, the first time in my life I have ever entered anything in an Art Exhibition. But I have had such fun producing my entry. The entry from required a full description of the piece plus a photograph of the whole exhibit and a second 'detail' picture. “Trilogy” is inspired by three things about the Norwich Shawl – it keeps the wearer warm, envelops the plainest dress in something beautiful and links with India [the Victorians’ “Jewel in the Crown”] I made three tea cosies- these keep tea warm, make plain pots beautiful, and may have Indian tea inside. Three needlecraft techniques- knitting, tapestry and appliqué, embellished with crochet, beading, and embroidery. Three materials – wools, cottons, silks. 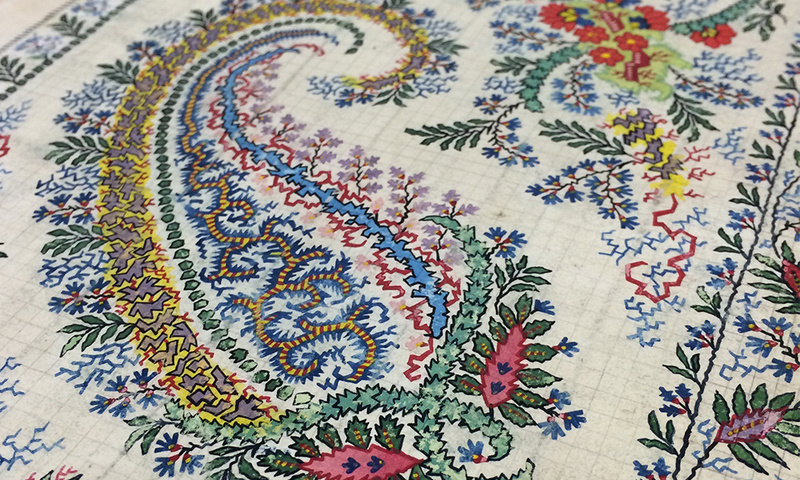 Designs inspired by the flowers, leaves and boteh motifs of the shawls. I learned needlecraft growing up in Norfolk –now living in Dorset, so incorporated a traditional Dorset button. In the unlikely event of my tea cosies achieving a place in the Cathedral, I will let you know! Today is the 150th anniversary of the birth of Beatrix Potter - gifted writer, illustrator, farmer - and conservationist. We loved B-P when the girls were smaller, and still have the set of all those little pocket sized storybooks. I decided when they were babies that these were heirlooms, too precious to be used - but now that seems daft. 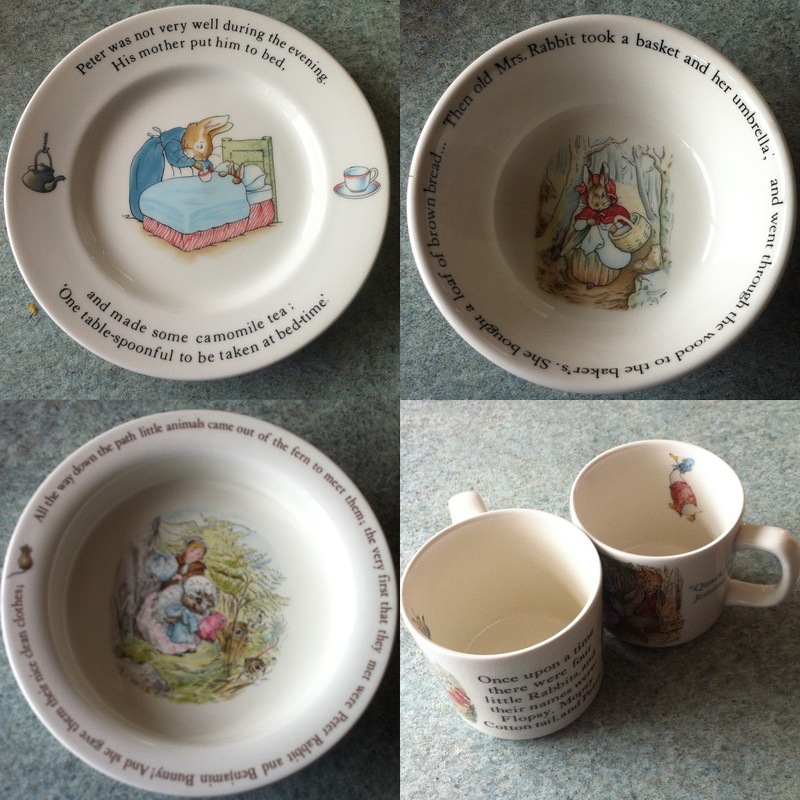 I had a little china Bunnykins mug and bowl as a child, which I used daily for years. On reflection, I am amazed my mother let me have a piece of Royal Doulton in my clumsy hands [and at some point they got broken] but they felt so special - and the grown-ups weren't allowed to borrow them! 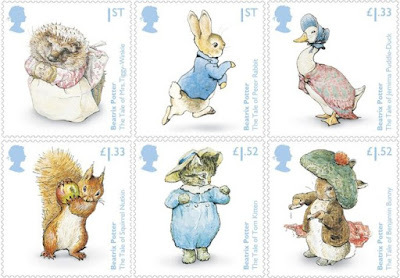 So the clean china will be repacked and go off to live in Norfolk - where little rabbits hop gleefully in the field, just around the corner from Cornerstones. And my grand-daughter can enjoy using them when she is a little older. I am sorry, Liz and Steph, that you missed out on them, but the next generation can have fun eating porridge from the bowl, or cakes from the plate! Do you use such heirlooms, put them on display, or keep them safe in a box? Suddenly I seem to be doing lots of sewing. 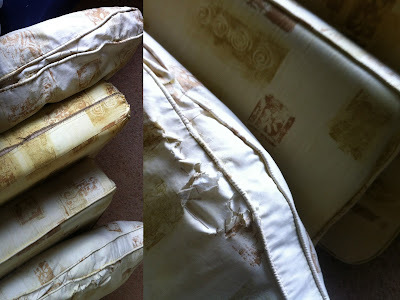 This week, I have been recovering the cushions from the bamboo suite belonging to some good friends. It has been in their conservatory, and suffered quite a bit from sun damage. After 16 years, I am not surprised some of the fabric has disintegrated! One sofa and two chairs in serious need of restoration. Zips have broken, covers have split, and many of the cushions have faded considerably from their original golden colour. But some fabric from IKEA and a bit of work with the sewing machine, and all looks fine again. This should be good for a few more years of family relaxation! Spasibo is Russian for Thank you. On June 16th we had some horrendous rain here - and I looked out of the window to see a young woman across the road, sheltering under a tree, trying to hold a plastic carrier above her head. I went to the door and shouted 'come inside, please shelter in here!' but she replied "No! No!" Then the rain got even heavier - I changed out of my slippers, and grabbed a coat and ran across to her "Please come inside, it is so wet!" and she said "I do not speak much English" - but she came in anyway. We hung her dripping raincoat on the coatstand in the porch, and went and sat in the lounge, and I made her a cup of tea. Her English was actually quite good - she was from Belarus, and 31 [the same age as my Steph] her husband was a policeman. 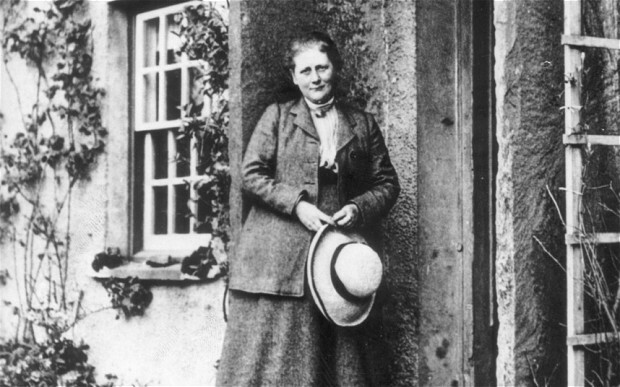 She'd come to England for 2 months, to improve her English, and was staying with a family near Southampton. Her host worked for this charity, and my young friend was helping by distributing collection bags through the letterboxes in Ferndown. I found a map, and she pointed out her town - Babruysk, which is South East of Minsk, the capital of Belarus. Then the rain stopped - and she had to leave. She thanked me profusely and we hugged - and she left. My dapper little chap is a souvenir of Babruysk - The name Babruysk probably originates from the Belarusian word babyor (бобёр) which means beaver. 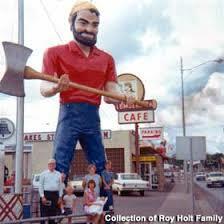 There used to be many of these creatures in that part of the country. What a lovely thought on her part, to leave this unexpected little thank you gift. I shall treasure him. 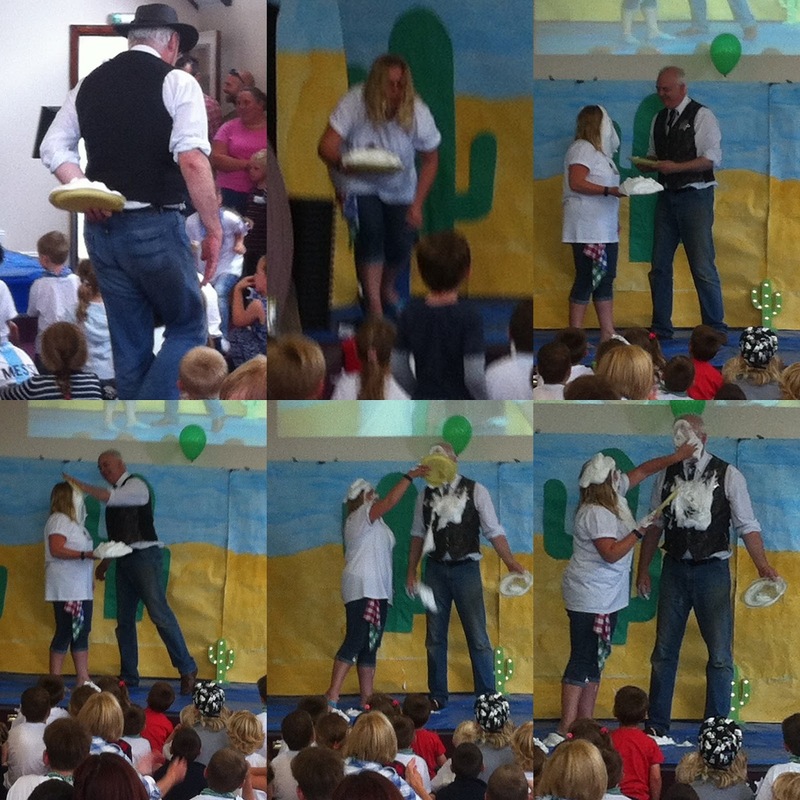 Spasibo, Olya - I hope you have enjoyed your time in my country - in rain and sunshine. It was a delight to meet you! No not him - that chap is Chief Scout, Bear Grylls. No, I had to grill a bear called Bert from Lancashire. How big is your chest Bert? 10"
How long is your body? 4"
How long are your arms? 3"
How fat is your tummy? 12"
Why do you need a shirt? 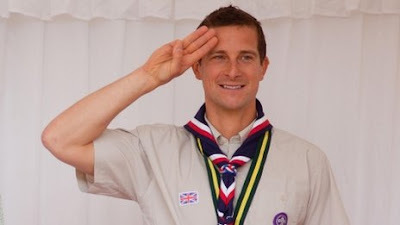 I'm going to a Scout Jamboree in Poland with my friend James in August, and I need a uniform. Can it have a pocket and a button-down collar, please? 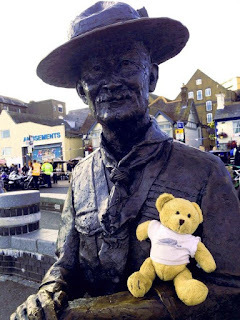 So I got out my folder of teddy patterns, and then realised I don't have any small teddies around for modelling purposes. But Snoopy is just about the same dimensions. The hardest challenge was the collar, but I got it to work, and opted for press studs under the front flap rather than the faff of button holes. I was quite pleased with the shirt once I had finished. I hope Bert-The-Bear enjoys his trip to Poland - maybe he will actually get to meet Grylls-The -Bear while he is there. I made one final modification - I wasn't happy with the colour of the shirt- it needed to be browner, and less grey. Soaking the shirt in tea overnight definitely improved the colour. Holt ! Who Goes There? Check out his website here. 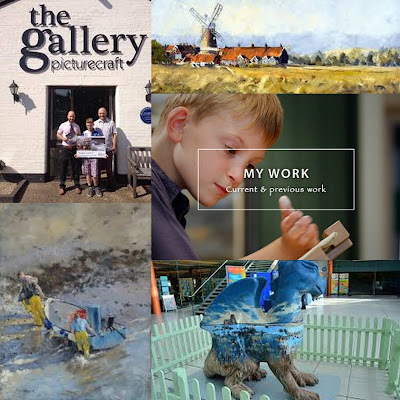 The staff at The Gallery spoke of him as a really pleasant young man - generous and friendly - but with a great future ahead of him. After being blown away by the artwork, we went off to the Folly Tearoom in Hopper's Yard for a cup of tea. 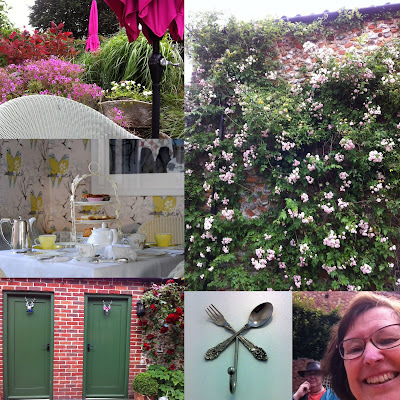 This is very stylish - the gardens were a symphony of pink blossoms - with toning parasols. Even though it is in the middle of a bustling little town, the tea garden feels peaceful and secluded. Inside there were cakestands laden with delicate fancies for elegant dining. Outside, in the public courtyard, doors marked with two deer heads with pink and blue ribbons indicated the loos. I have never seen quite such a posh coat hook in a public loo before!! I still haven't got the hang of taking selfies with my new phone. I think my arms are too short - but I refuse to get one of those stick thingies. Our other outing was a walk on the Sunday afternoon to Foxley Wood. 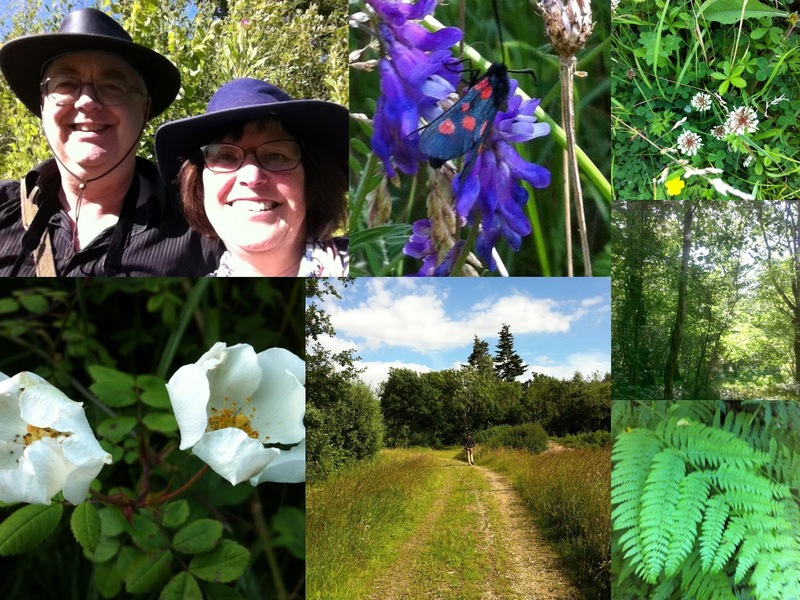 The flowers and foliage were gorgeous, and the moths and butterflies utterly amazing. I checked up on the blue one with the red spots. I think it is a six-spot Burnet [Zygaena filipendulae] , but I am not sure. It was certainly a beauty. Bob took this selfie in the sunshine. What a glorious county Norfolk is - looking forward to being back there again soon. It is indeed very attractive- and it is good for holding synthetic ropes without slipping. I am not sure when I should use it, but as the saying goes Better to know a knot and not need it, than need a knot and not know it. Dave was at pains to point out that there were two ropes as I abseiled down - the one I was holding, which passed through my carabiner at my waist, which I let out gradually to allow myself to descend - and the safety rope he had tied to my chest, which he held at all times. "You're holding on - and I'm holding on - so even if you should let go, you won't fall"
And sure enough, Dave did hold on, so I could wave my arms and even try little jumps. And he guided me to a safe landing. When it was time for me to climb over the edge of the parapet, I suddenly remembered the motto of Spurgeon's College, where Bob studied for ministry. 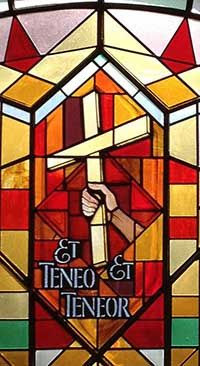 "Et Teneo et Teneor" - "I both hold, and am held"
The beautiful stained glass window in the College entrance hall is a vivid reminder. Yes, by faith I cling to the cross of Jesus, claiming Him as my Saviour - but when my faith is weak and faltering I know He is still holding on to me, and He will never let me fall. And that gives me the strength to face whatever lies ahead of me. You probably recognise this tear drop motif, correctly known as boteh inspired by the territories which bordered Kashmir. This pattern developed from a vase or bunch of flowers with tightly packed heads bending at the top, into the familiar decorated pinecone shape. 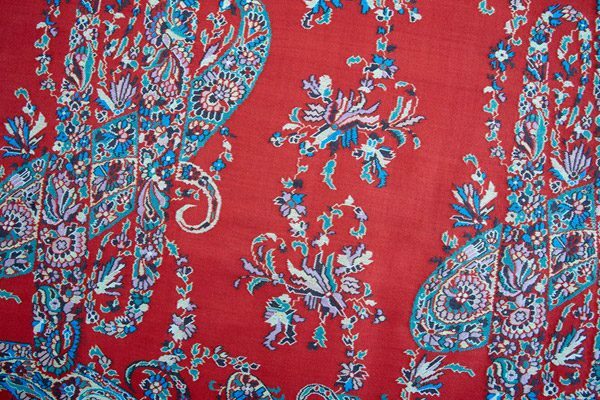 Nowadays, we call this highly decorated tear drop pattern Paisley, the name of the Scottish town which used the design to decorate its shawls in the early nineteenth century. 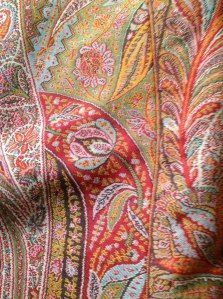 However, Paisley wasn’t the first British town to produce shawls decorated in this way. 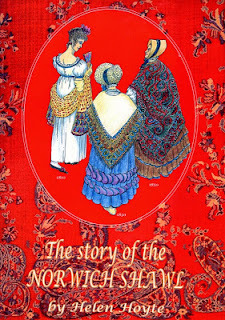 Norwich had been using a similar pattern on the borders of their shawls since the late eighteenth century and by the nineteenth century, there were at least twenty shawl manufacturers in the town. In India, each shawl needed the fine wool of 27 goats – but the Norwich weavers, with long experience of working with fine quality, lightweight fabrics, developed a combination of silk and sheep’s wool which was soft, warm and strong. The development of the Jacquard loom with its perforated pattern cards, allowed ever more complex patterns to emerge, which eventually covered most of the shawl rather than stopping at the borders. 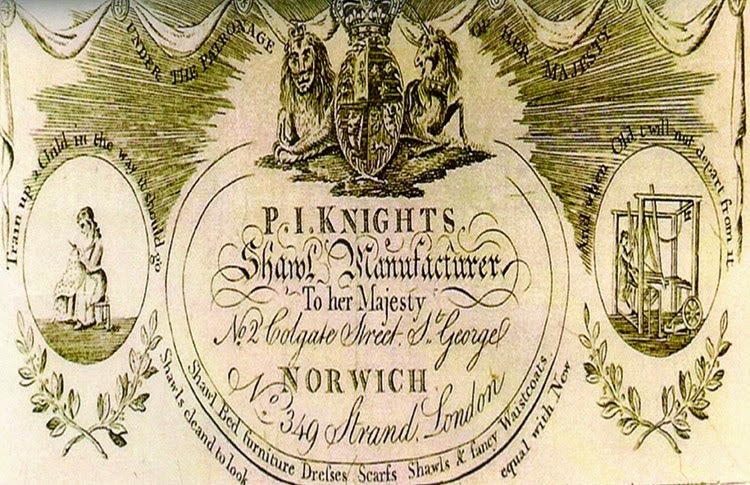 In the first half of the nineteenth century, Norwich manufacturers were dismayed by other towns, like Paisley, copying their patterns and flooding the market. In 1842, it became possible to register a design at the Public Records Office for one shilling. However, this protection was only valid for between six and twelve months so only a few companies took the opportunity of protecting their patterns against piracy in this way. 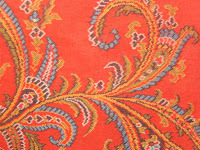 The finest Norwich shawls were woven between 1830 and 1860, and in 1850, printed shawls came onto the market. 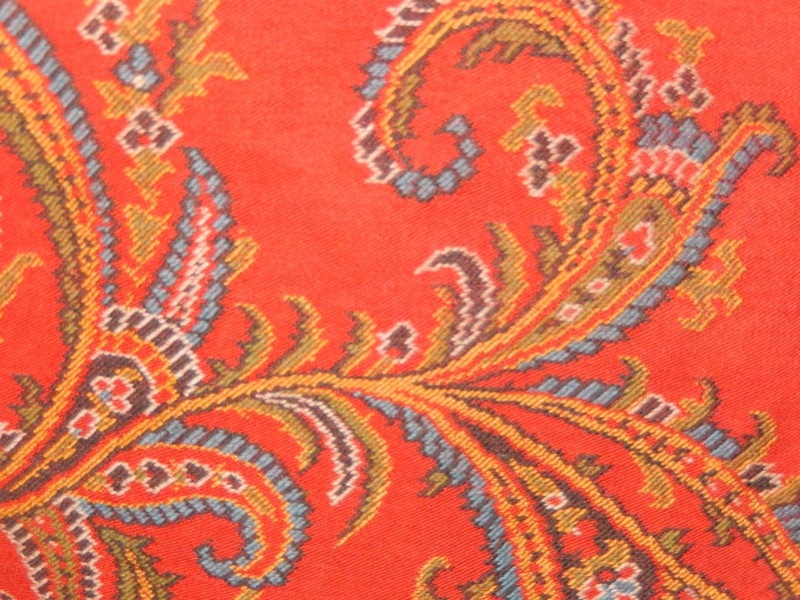 Many Norwich shawls were dyed with a colour identified as Norwich Red. 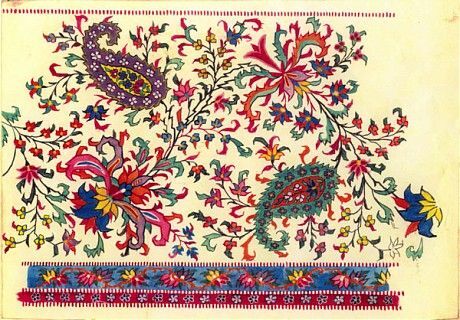 These shawls, designed to cover crinolines, were over six feet square, or a twelve foot rectangle, filled with boteh sometimes five feet in length, filled with flowers and covering the whole shawl. Some Norwich shawls were displayed at The Great Exhibition of 1851 and Queen Victoria ordered some for herself. In October, there will be a special exhibition in Norwich Cathedral celebrating Norwich Shawls. 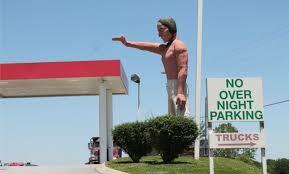 I am planning to visit when we are up at Cornerstones that month. But I shall say more about this next week! 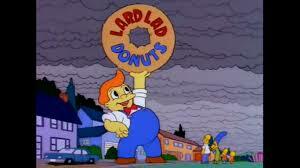 If you watch the Simpsons, you may have seen Lard Lad- the advertising figure holding up a Donut. 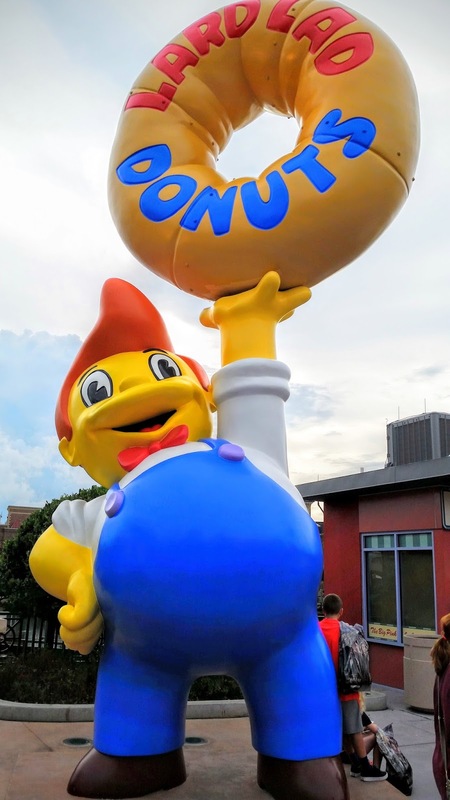 The lad is meant to be around 20 feet high - and his donut adds another 10 feet or so. Pretty tall . 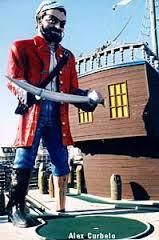 If you go to Universal Studios, you'll see a full size fibreglass representation of him outside. The Simpsons creators got the idea from the large advertising figures made by International Fiberglass [A California boat building company] back in the 60s and 70s. 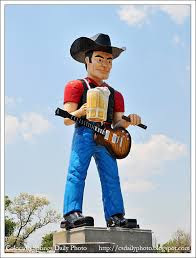 The idea was that these huge figures would catch people's attention as they drove down the US Highways, and they would then pull off the main road and visit the small towns en route. 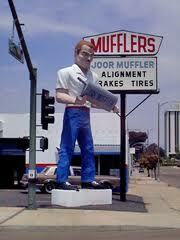 Most of them were "Muffler Men" [muffler is the US term for car exhaust] We might say 'Kwik-Fit-Fitters'. 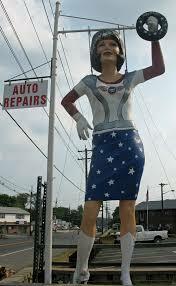 'Some were less politically correct- Native Americans for Pontiac dealerships, and the UniRoyal gals [some in skimpy bikinis] flaunting their pneumatic products. There are about 200 still in existence, and a team of enthusiasts led by a guy called Joel Baker [a TV Audio Technician] work in their spare time to restore them to their original colourful glory. I suppose they have a lot more wide open spaces over there to plant these giants, I am not sure I would want one at the end of my road. Joel says that whilst they fell out of favour a while back, and folk were embarrassed to have them in the neighbourhood, now they are becoming popular again and regaining their roles as tourist attractions. 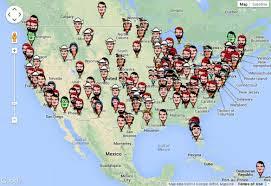 Have you seen any of these in the States? Perhaps Miriam could get a giant Cowboy to stand outside UCF next week to advertise our Wild West themed Kidz Club? This Heat Is Terrific - But Also Sudorific! That's my new word for the month - it means 'sweat inducing' . Forget all that stuff about 'horses sweat, men perspire, and ladies gently glow' - I turn into a damp, tomato coloured wreck. And I up my liquid intake - usually with tea. "Tea! Heat and thirst and excitement had done their worst for Rose. She was limp and weary and her throat ached. The imminent prospect of a cup of tea roused her to trembling excitement. 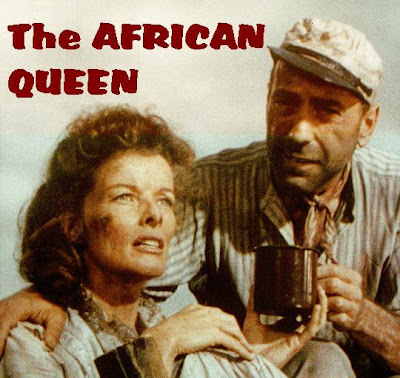 Twelve cups of tea each Samuel and she had drunk daily for years...Tea! A cup of tea! Two cups of tea! Half a dozen great mugs, strong, delicious, revivifying......She gulped down mug after mug. For a moment her body temperature shot up to fever heat, but presently there came a blissful perspiration - a beneficent and cooling fluid, bringing with it a feeling of ease and well being. "Those Belgians up at the mine wouldn't never drink tea" said Allnutt..."they didn't know what was good"
I spent two days with Liz, Jon and Rosie this week, as I had WWDP stuff up in London, and Liz served me the most delicious caffeine free iced tea. She gave me the simple recipe. 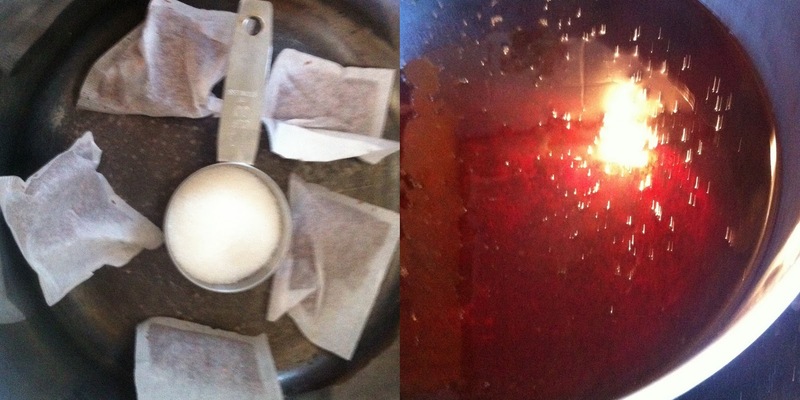 Put 5 redbush tea bags and ¼ cup sugar into a saucepan. Add 2 litres of boiling water. Brew for 3 minutes. REMOVE THE TEA BAGS. Now simmer until liquid reduced by half. Let that cool, and pour into a bottle. Store in the fridge. 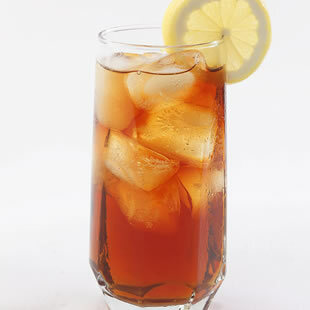 When you need a refreshing drink, use this syrup as a base, and top up with water [plain or sparkling] and lots of ice. Add lemon slices, mint leaves or sugar to taste. Cool! In The Library With The Lead Piping! The Pastor's Wife Is NOT A Pocillovist!